No rain in sight, says the weather forecast. So far three weeks of highs over 90s with out much rain. There have got to be ways to beat the heat. 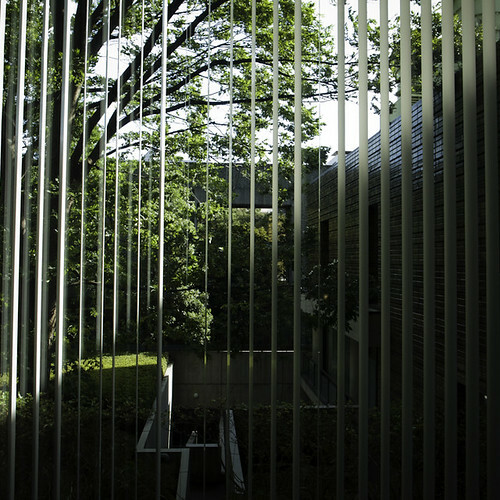 One way is to seek the urban oasis. 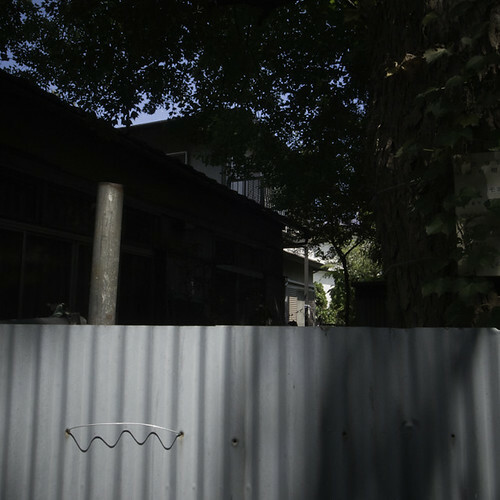 A beer garden, a tiny izakaya (Japanese bar), even the local convenience store and squatting in the shade with a can of ice teas. We all have our ways of dealing with the heat. To each his/her own. Find your shade. Keep your cool. Enjoy the heat before its gone till 2013. 20 years ago, Hurricane Andrew was a category 5 storm that hit South East Florida on August 24, 1992. I was living in Tampa, Florida and only experienced some bad weather, my family and many others suffered through the storm of the century as it was being called. Countless property was lost and Miami, especially Homestead, Florida was an utterly appalling disaster area. Water was scarce, tempers ran high as people struggled to provide the survival necessities. My family’s home was severely damaged in the storm forcing my family to relocated to North Miami while the repairs were being done on the home. I still regret for not realizing the extent of emotional and physical damage to my family. I should have packed up my Bronco with supplies and headed to Miami, but I didn’t. And, for this I am deeply sorry. One positive outcome of the hurricane Andrew was that my beloved brother and I grew much closer cultivated our brotherhood. I am not exactly sure when these pictures were taken. It was sometime later probably in Autumn of 1992 when I took a drive around Homestead to see the damage with my own eyes. The streets were unrecognizable, I couldn’t tell one from the next. All of my childhood landmarks were gone. The Miami that was part of my soul was blown away as the 175 mile per hour winds (280 k/ph) hit the city of my birth. When I drive Krome Avenue these days, it still looks more barren than it ever was, except for all the cookie cutter developments that was sprouted over the last 20 years. All these years later Miami has become a greener city again. Many of the trees have grown back and some of the neighborhoods look lush as they used to, but not the same. There are neighborhoods you can visit in between Miami and Homestead where the only the foundation of buildings remain. It is hard to believe that 20 years have passed since that day. These pictures were taken with my beloved Nikon FG, and a taped up and reloaded disposable panorama camera. They were also hand printed in my university’s darkroom. Some of my first prints to be done in color. My color balancing skills were not as good as they are now. As I can now use my digital darkroom to work on my pictures, part of my heart still belongs to the magic of watching an image come alive in the developer. Looking back now I have come to the realization how much this event changed my life. 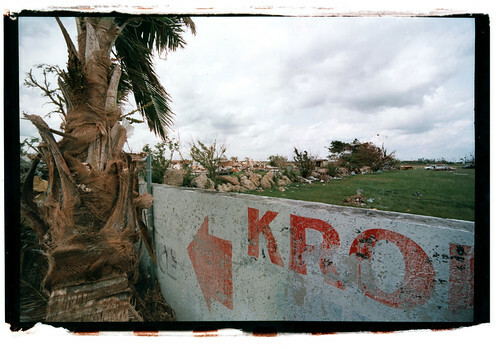 Hurricane Andrew not only tore down buildings but it ripped some families to shreds. I am thankful that my family was safe, and that we all survived to be together. Let us not forget this tragedy as other storms barrel their way across the Caribbean and the American South, especially the land of my birth, Miami. I went out to the center of Tokyo for a house warming party for two of my close friends. I don’t get out to trendy Ebisu very often even though it is home to the Tokyo Museum of Photography in Ebisu Garden Place. Actually, the last time I had been in Ebisu was to meet up with a mate at his office located on the edge of Ebisu and Shibuya. Among the high class restaurants and private homes, I came across a few square gems. Homes that must have been in the neighborhood long enough to see the urbanization creep around every narrow street. 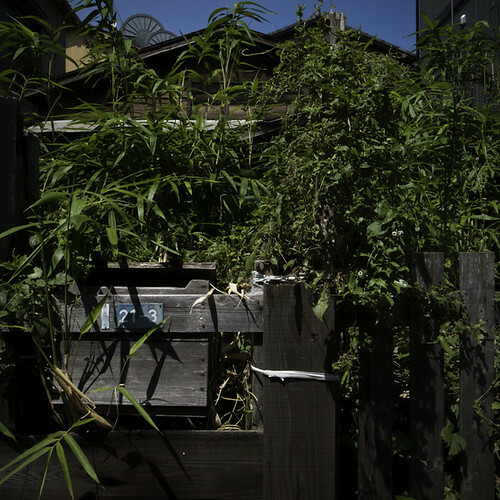 Homes with unruly gardens that spoke to me as as out of place as myself. 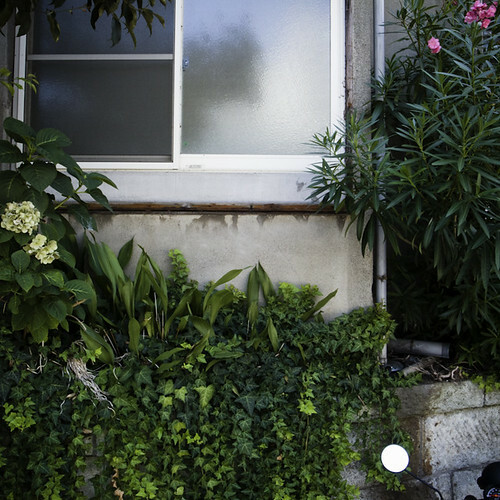 The ivy creeps up the window sills, flowers bloom in spaces that would have been forgotten in the west. I love the way that no space is left unused in Japan. So, it is just me, feeling a bit square in Ebisu. That is all. Its the height of summer time in Japan, so what do I do? I pick up my camera and hit the blazing hot streets. There is something about walking around Tokyo when the temperature hits 35 C (95 F). 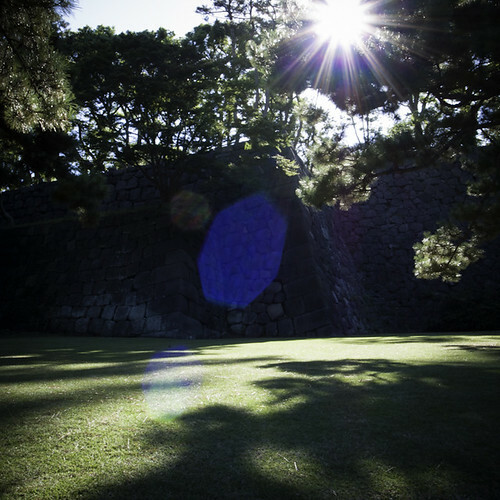 I like to feel the suns burn as I wander the streets, parks and gardens of Tokyo. It makes me feel alive to sweat in the sunshine. I was making my way back from Iidabashi station following the street to see where it takes me. 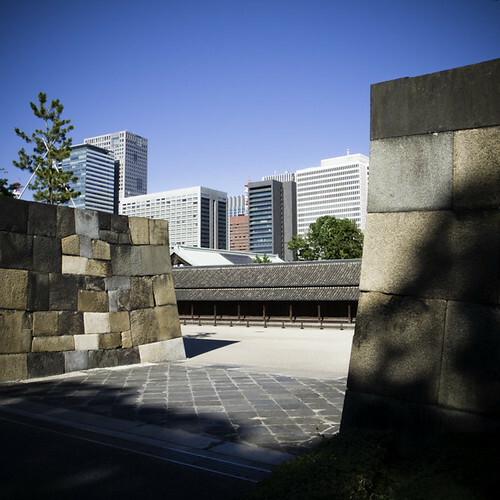 I had rounded the corner of a newspaper companies office building when a curving bridge over the moat to the Imperial Palace caught my eye. I saw a policeman there so I initially thought that I wouldn’t be able to enter. I spied some reddened tourists coming out, so I said I might as well give it a shot. 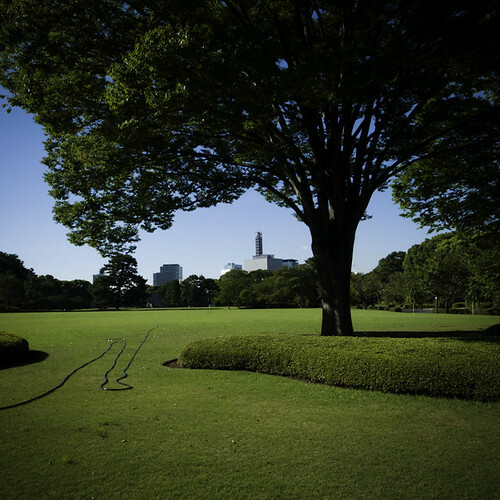 It is called Kokyo Higashi Gyoen (Imperial Palace East Garden). I had to collect a free plastic ticket at the gate, that had to be returned on exiting the park. The emperor does live in the Imperial Palace so they need to know that all that entered have left the park. This is one of the tourists spots I didn’t even know existed. I had wandered around another section of the Palace before, but this was the first time to wander around these gardens. 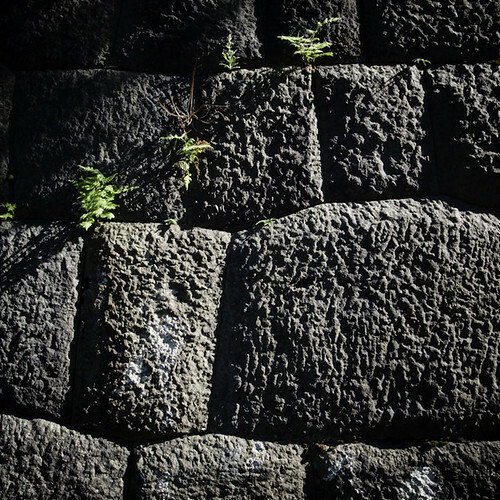 The sun was beaming down on the gravel and paved roads that weaved between the gigantic retaining walls of the Imperial Palace. I quickly became lost in the scale. The walls were so massive. The corners jutting into the blue skies. I felt so far removed from the hustle of Tokyo that borders all sides of the gardens. Sweat rolled down my forehead as I made my way through the park. Pausing many times to photograph the walk. 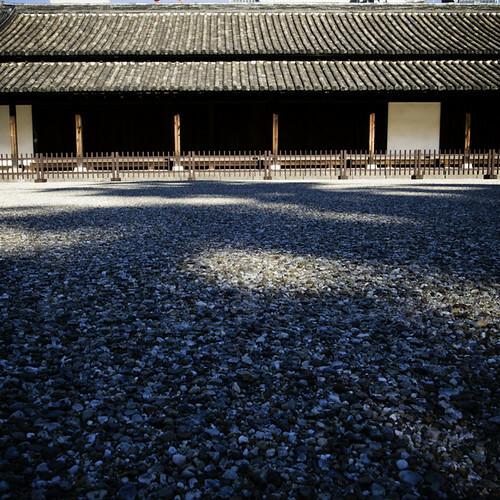 Perfectly manicured lawns contrasted with the hewn stones of the walls. All in harmony making for a wonderful stroll in the summer light. Tokyo never stops surprising me. I am still finding treasures after being here for more than 10 years. This will be a place to go back to and see in another season. Today was a beautiful sabbath day. The thunder came early in the day and threatened to rain for the longest time before the drops fell. The clouds scattered and the sun came out once again. 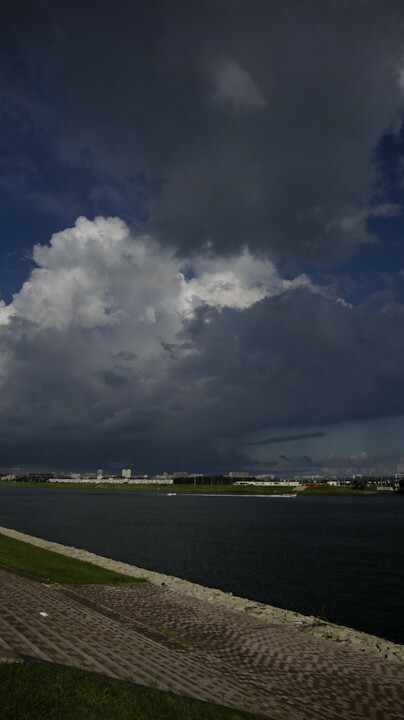 In the late afternoon I noticed some dark clouds heading in from Chiba, so I hopped ob my bicycle to se what there is to see. Sometimes it is just the act of picking up a camera that will get me out of the house. I wanted to see the clouds. Not only did I want to see them, I wanted to photograph them as well. Clouds are a subject that I would have rejected in my youth but if they were good enough for Alfred Stieglitz, then I might as well be able to enjoy their mystical shapes too. I even got caught in a little misting as I rode along the rivers edge. In a completely urban setting I am never utterly removed from nature. Looking up is sometimes all that it takes. There is a little pot of golden pixels out there somewhere, for us all. You just have to have an open heart to find it. The summer’s cicadas are singing their song as I was making my way to Nishi Kasai. The sun was high and clouds fluttered across the road, making it a bit cooler than it should have been. 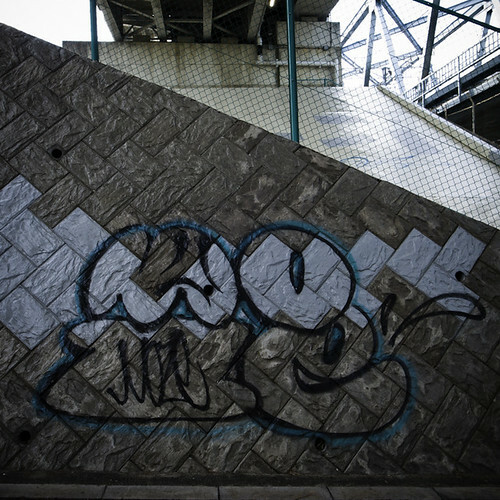 I found a couple of MOZE tags that must have been pretty old, but nothing out of this world. I pedaled past a small street and a huge patch of green caught my eye. I circled back around and stood in front of a two story apartment building that was covered from top to bottom in morning glory vines. At first I thought that the building had been abandoned, but one of the doors was clear from vines because of use. There also was a small line up of bicycles in front too. 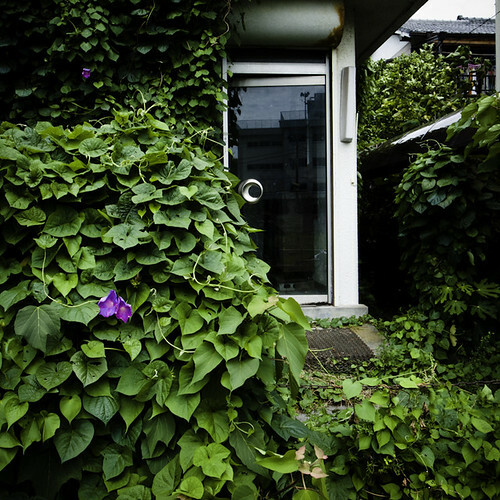 The flowers had only begun to bloom, but the entire building had been engulfed by the creeping vines. Just another summer day spent pedaling through my neighborhood. Yesterday I went on a MOZE hunt in my neighborhood. I’m not exactly sure why I go hunting for MOZE tags and throw ups. It is kind of like photographic documenting version of collecting. I don’t photograph graffiti very often in my work. I feel that the art of graffiti is art and should more or less be left at that; however, I find MOZE to be a bit of an obsession. First of all MOZE is very active in my own neighborhood of Kasai. I see his tags, sticker slaps, and throw ups in my daily life. 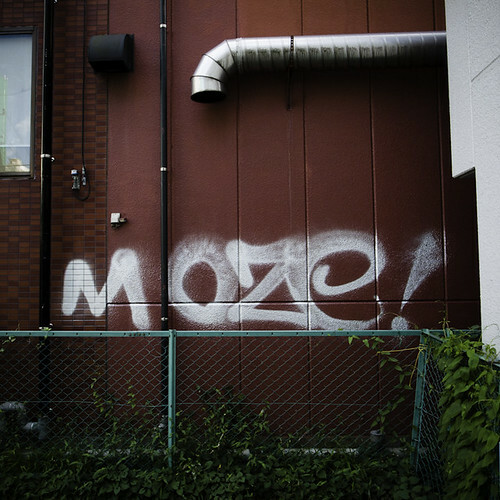 MOZE’s work is part of my neighborhood. I feel I need to document my interactions with MOZE even though we communicate via spray paint and my camera. MOZE is a bit of a mystery that I am trying to solve. Who is this writer? 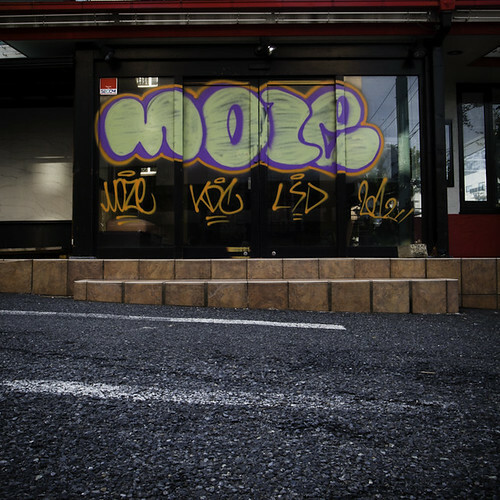 Is MOZE Japanese or a foreigner? 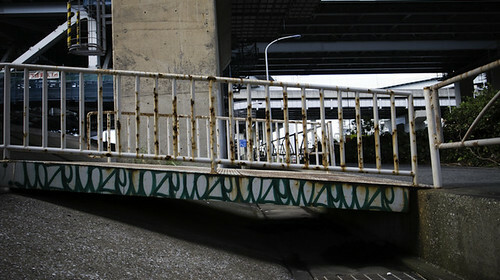 I have ben seeing his tags for years now, and I am just compelled to go hunting for his work about once a year. I am compelled to interact with MOZE. Throw the photographic endeavors we engage in a distant form of communication. On one of MOZE’s pieces he painted “Who Are You? 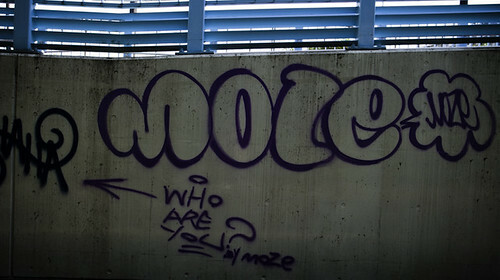 by MOZE” He is searching for the identity of another graffiti writer who’s work MOZE in unfamiliar with. Big time respect for the mad bomber of Kasai, MOZE. From Renaissance to Rococo. Four Centuries of European Drawing, Painting and Sculpture on loan from the Berlin Museum. It was an ambitious show that lead the viewer on a journey from the development in European art. The museum was packed with people of all ages drinking in visual information. Some of the sculptures were small ornamental figures, and church decorations. I loved bending down and looking at the statues in their eyes. Meeting their gaze into my one line of sight. With the three dimensional works I cloud descend to their vision field. In the Dutch masters room of the exhibition the people always gazed off into the distance. We could never line up our eyes together. We only could catch glances of each other. The masters could catch drama like no other. These action frozen moments for eternity. The instance as a fight is about to break out. The moment of spiritual enlightenment. Mad drama created with ground pigments and the artist’s imagination. As I often am so unimpressed with curations of the best of the new artists, I find myself longing for older works of art. I want to understand why these works have withstood time. What makes them so special that they have been admired. As I paused in a small anteroom between galleries, the light was cutting across the blinds. The courtyard was lit in the afternoon light. The moment was right. It took just a fraction of a second to create the image on the CCD. The opening of the shutter burned the light on the digital film. Another frozen moment of light and shadow. Will it stand the test of the ages? I really have no idea. All I know is that I will continue to seek inspirations and keep on clicking the shutter. As many of you may remember that a typhoon wrecked my garden a little while back. Now my patio garden is quite small, but we have been able to pluck a few cucumbers, peppers, eggplants from the potted plants. Not a lot, but enough to bring some freshness to our table and hearts. The garden has rebounded from the torrential winds and rains, but I had pretty much given up on our watermelons. The vines kept creeping along the patio, eventually spilling over the ledge and even became excited when I saw blossoms sprout from the twisting vine. Eventually all the flowers fell off without further growth into a watermelon. This all changed yesterday. I was looking at the vine, and I noticed that there were some oblong shapes where the flowers had been. I called my wife out to the patio, to show her the budding fruit. I was wondering how they will survive since the vine had wiggled its way up and around the cucumber poles. Then, my wife called me back outside to show me three baseball sized watermelons that had tucked themselves away under some leaves. I was overjoyed to see them! To be able to pick one up in my hand and feel the warmth of the sun in my palm. So beautiful. Such a simple joy gardening brings. We spent some time cleaning up and weeding the patio today, unfortunately this little one got clipped by accident. I shed a little tear, and was thankful for the ones that have come, and will come. This is my homage to fruit of summer. 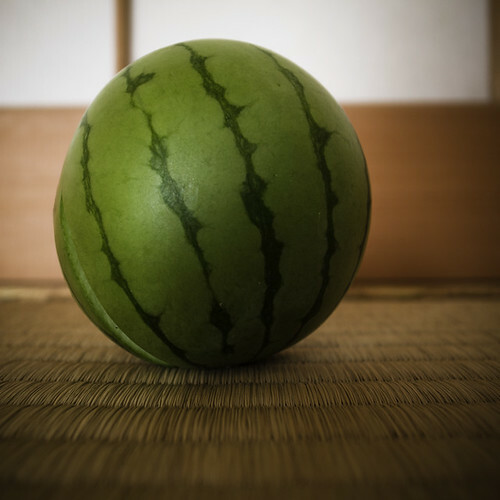 The lovely honorable watermelon. I am fortunate to have a friend like Tomo. He and I take a photographic journey every summer. Each year we go someplace different and wander around with our cameras chatting away as we go. This broiling summer Tomo suggested that we head to Chiba Prefecture’s country side. A place called Yorokeikoku Valley. We were blessed by some cloudy weather, so it wasn’t as hot as it could have been. We even got caught in some rain, but it didn’t dampen our mood one bit. It was a bit of a challenge to just get to, but the journey is what makes it so magical. I met up with Tomo at Shin Urayasu station and boarded the Keiyo Rapid train out to Soga. At Soga, we transferred to the Uchibo Line until we reached the little station commuter station of Goi. There the real journey began. We bought an all day pass to ride the Kominato line. It is known for its one or two car trains. The train otakus (geeks) love to ride and photograph this line. There was even an old fashioned train girl who would sell, inspect, and punch the traveler’s tickets. We got off about 3 stations before the last one and started to walk some of the old country roads. It was a great feeling to be out of the heat of the city, and be surrounded by farms, cicadas, and trees. We passed though some tunnels which here in Japan have the reputation for being haunted on our way to the next station. We had to wait a good 45 minutes since the Kominato line comes only about once or at the most twice an hour. Being out in the country I am reminded how much more there is to Japanese society than the city. 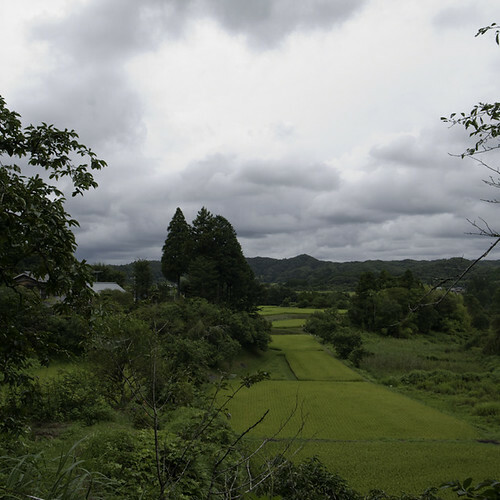 In fact, most of Japan was an agricultural society up until very recently. Most of the society were subsistence farmers just a few notches above. The rural life was the Japanese life. 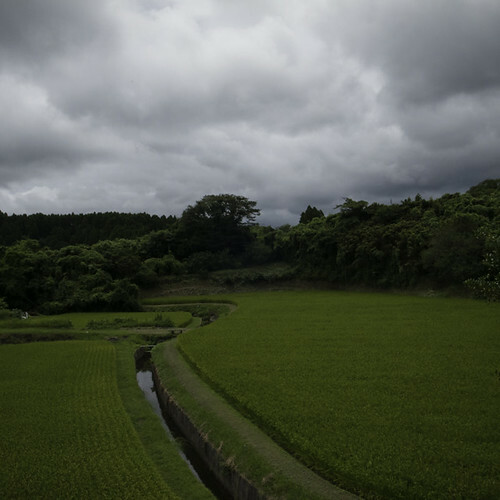 Walking along the old roads and coming to a rice paddy that tucked into one corner is the family cemetery. 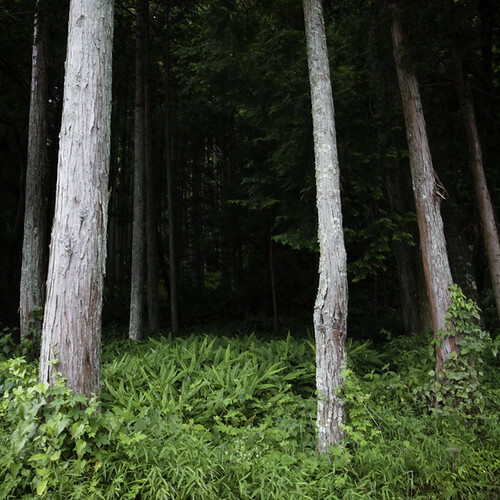 The hillsides were dotted with tiny Shinto shrines and Buddhist temples. In an odd way I was reminded of the parks between the hills Berkeley and Contra Costa County. They are very country, even though you are only 45 minutes from San Francisco there are reminders that the city isn’t that far away. 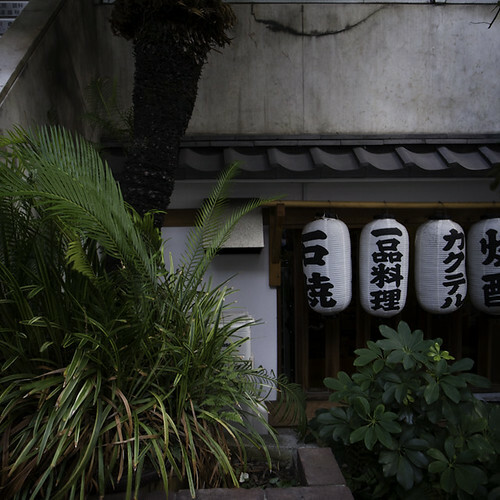 There were still signs of Japan’s industrialization at just about every turn we took. All that is true, but the country is the country. 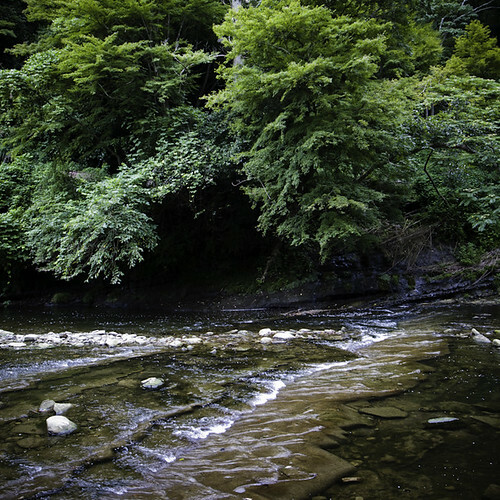 The loud tranquility was a beautiful excursion from the hustle of Tokyo Life. 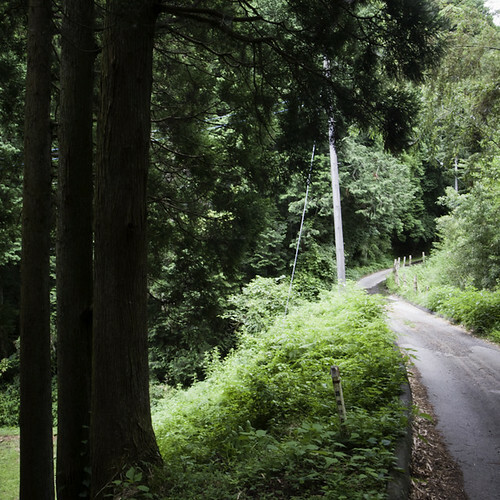 I look forward with an open heart to wander Japan’s rural side with camera in hand. You are experiencing the archives for August, 2012.